Well, today my sweet girl, Heather, begins her flight home ! I'M SO GLAD... there's just something about her being gone on this trip that has me so uneasy. I have no clue why... can't answer it.. but I just do. You know that "mother" instinct... it's just something we all have. I know that she is with a safe travel group, doing God's work... but I JUST - SIMPLY - WANT HER HOME! Then.. I'm not sure what the rest of the day holds for us... we'll just wing it I'm sure. I have all of my 'teaching' kits ready for Saturday and Sunday. The list of participants has grown to 45 (so I made 50.... just in case) so we will have a blast I'm sure. This session is going to be a discussion on them taking different ideas from different sources and making them into THEIR designs - and making them into different things - from what they normally see 'wool' products. For example - covering the lid on a basket - wool decorated lampshade, adding wool to a picture frame, etc. I'm issuing each of them a "challenge" so we'll see where their creativity goes!!! Hey... look at this adorable fabric I found at Cinnamon's Quilt Shoppe! I'm making pillow cases with it!!! BBBBBBBBBBBBBAAAAAAAAAAAAAAAAAAAA................ Now I won't have to count sheep when I go to bed...just lay on the pillow! HA!! I finally got my SOCK PICTURE to come up...look!!!! Are these wild or what??? 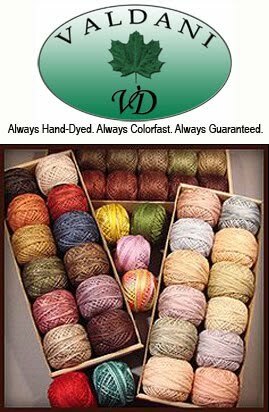 Mine will not look exactly like these... but I did get the yarn that makes cool stripes when it's knitted - in blues and greens. Wah......I want to get started and I still have two weeks before class!!! I forgot to tell you the other day... I am now the proud owner of Angry Birds band aids. These are a hoot... When I saw them (shopping with Lexie) I told her we just had to have these! She giggled and was excited and then proceeded to tell me "GG... you are so silly!" What on earth gave her that idea? I'm so shocked!! 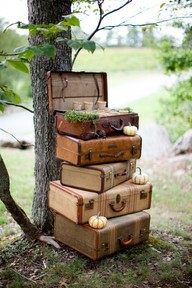 Old... Old... suitcases.. and they MUST have this look! I don't know how many of you like to antique shop... well, let me tell you... these sweet little puppies are almost impossible to find! I look in every shop I visit. They have completely vanished! I guess everyone else likes them too! AND... I want names... who bought all of them??? Vintage sewing stuff!!! LOVE IT!!!! 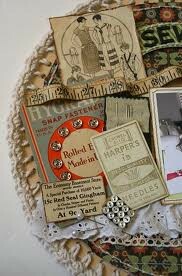 This photo has it all, lace, buttons, hat pins, snaps, needles and my all time favorite - paper or cloth tape measures. I remember my grandma and mom using these all the times. Heck..that was before we had plastic! Now that is a "nasty" thought... I was around before they started making everything from plastic. OMG!!! Also.. antique lace. Doesn't it look so cute wrapped on the old wooden spools. Just think...they are all plastic now... boo hoo. 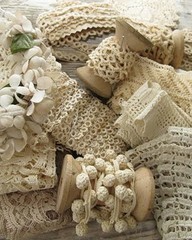 I have a huge collection of wooden spools.... Back to the lace... I wish I could think of some beautiful project to make with it...but it's just pretty all sitting in a huge glass jar at the moment. You know...we were talking the other day (while antiquing) at how old we feel because things we played with are now in the antique stores. Well, here's one to top that... the things that my oldest son played with... THEY ARE NOW IN THE ANTIQUE STORES... Now that will put a wrinkle in your crinoline! DARN IT!!! I simply have toooooo many things to get done to be getting this old. May I live to be 100!!! 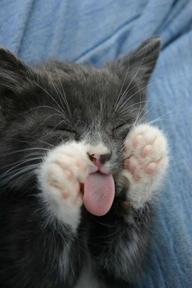 "nane-nane-poo-poo !" or "yegth...that didn't taste good"! May you have a blast today!!! Have fun doing whatever your little heart desires!